Efforts will be made to identify the model biases in both free runs and hindcast runs for both the coupled modelling systems (NCEP CFS and UKMO UM). The reasons behind the growth of these model biases (errors) will be investigated and probable sensitivity experiments will be carried out to reduce these errors. Some of the studies (at IITM) related to identification of model biases has already been mentioned in Section 5.1. The models which show fidelity in mean monsoon circulation are expected to perform better in real time monsoon prediction. 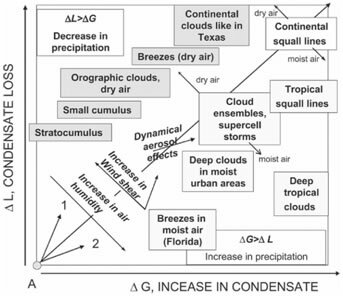 Arakawa (2004) gave a detailed review of the conceptual framework of current cumulus parameterization. Arakawa (1975) mentioned that clouds and associated microphysical processes affect the climate system through the coupled radiative-dynamical-hydrological processes in terms of release of latent heat of condensation, evaporation etc. and redistribution of latent and sensible heat in the atmosphere. There are other important processes related to Ocean and Planetary Boundary Layer (PBL) as well. Cumulus convection plays an important role in the mentioned coupled processes. Therefore representation of cumulus convection or cumulus parameterization in numerical model is one of the most important component that can affect the model simulation. Much of the model uncertainties are attributed to the inappropriate representation of clouds and associated processes. Major practical and conceptual problems in the conventional approach of cumulus parameterization, includes inappropriate separations of processes and scales (Arakawa, 2004). The intermodal variance of projections of ISMR (Indian Summer Monsoon Rainfall) by the models in the Fourth Assessment Report (AR4) of the Intergovernmental Panel on Climate Change (IPCC) is as large as the signal of increase in the ensemble means (Randall et al. 2007). Among a few other reasons, a major reason for the current suite of climate models’ poor skill in predicting the seasonal mean ISMR and uncertainty in the projections under climate change scenarios is the large systematic dry bias over the Bay of Bengal (Randall et al. 2007). Keeping the above studies in to account and the present performance of cumulus parameterization, a suite of approaches are planned to be implemented in the CFS Version2 model for the purpose of improving the ISMR. The studies based on observations (Abhik et al. 2012, Chattopadhyay et al. 2009, Goswami et al., 2011, Jiang et al., 2011) gave a framework to understand different mechanisms related to dynamics and cloud processes during different phases of ISMR. The hypothesis put forward for the mechanism which is responsible for evolution of different ISMR phases could be actually tested in a coupled model such as CFSV2 provided the necessary representation of cloud processes are implemented. To develop a Multiscale Modelling Framework or Super parameterized CFSV2 where several Cloud Resolving Models will be inserted in each CFS grid to explicitly compute the tendencies of cloud hydrometeors and the heating contribution which then would be fed back to the CFS. A schematic of the SP-CFS framework is shown in Fig. 13. To adopt a microphysical parameterization which has the ability to compute the tendencies of all the observed hydrometeors namely cloud water, cloud ice, graupel, snow, rain to test whether the space-time distribution of the condensate would modify the vertical heating profile of the model and in turn would influence the divergence-convergence in the upper and lower atmosphere. Finally to change the space-time distribution of ISMR. Another approach would be to develop a Stochastic multiscale multicloud parameterization within CFSV2. The present day cloud-convective parameterizations are deterministic type. Keeping in mind the inherently nonlinear and chaotic nature of atmospheric processes, a stochastic approach will be attempted (Majda et al. 2011). Quantitative forecasting of precipitation has been one of the major challenges in operational General Circulation Model (GCM). Besides other processes, understanding of microphysical process is one of the key aspects in GCM. The effects of clouds on the treatment of condensation and evaporation are also important in the precipitation calculation. Although using simple scheme some reasonable precipitation forecasts have been produced but one cannot neglect cloud water and cloud ice in the model thermodynamic and hydrological fields. Furthermore, the exclusion of ice-phase clouds in the model can lead to underestimates of latent heat released above the freezing level and therefore weakens the feedback of condensation to the thermodynamic fields. Recently Waliser et al. (2009) have shown that the representation of cloud ice in GCM is inadequate. They have analyzed many satellite data and pointed out that even though parameterization in GCMs accounting for cloud ice processes have, still is not sufficient. 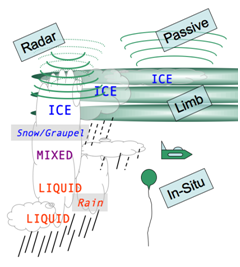 A schematic diagram illustrating measurement methods for estimating cloud ice water content/path, including in-situ measurements as well as passive, radar and limb-sounding satellite techniques have been shown in Fig. 14. Fig. 14: Schematic diagram illustrating measurement methods for estimating cloud ice water content/path, including in-situ measurements as well as passive, radar and limb-sounding satellite techniques. The parameterization of precipitation production is required in order to water substance from the atmosphere to the ground. The difficulties in the precipitation calculation arise from the complexity of the precipitation formation processes that involves complicated interactions among precipitation particles of different size, shape and phases. A complete description of precipitation formation required a good understanding of the characteristics and behavior of the different hydrometeors in the atmosphere. Understanding the representation of some processes like auto-conversion and accretion in the warm phase, aggregation and the Bergeron process in the mixed phase of the GCM are also essential. The cloud ice growth processes are associated with ice mass and/or particle diameter and also particle fall velocity. The deposition is the primary process associated with cloud and snow, while riming is the primary processes responsible for graupel formation (Fig. 15). The biases in GCM representations of clouds – initially ice and liquid water content profiles (CIWC and CLWC) and integrated paths (CIWP and CLWP), with more recent efforts involved in exploring and quantifying the radiative impacts of precipitation – which is often ignored in GCMs. Additionally, cloud-aerosol interaction and the role of cloud condensation nuclei (CCN) and ice nuclei (IN) of various species (e.g., mineral dust, soot, bio-aerosols) (Chen et al. 2008, Hoose et al. 2010) are important for the cloud ice and mixed-phase cloud formation. To perform a realistic model simulation, one needs to know not only microphysical mechanisms involved but also the properties (i.e. ice nucleation capabilities) of IN species. Fig. 16: A schematic diagram of aerosol effects on clouds and cloud systems of different types. The zone above the diagonal corresponds to a decrease in precipitation with aerosol concentration. The zone below the diagonal corresponds to an increase in precipitation with an increase in the aerosol particle concentration. There is ample evidence that dynamical coupled models of the Earth’s climate system are reasonably good sources of seasonal predictions of the Indian monsoon and that the Climate Forecast System, version 2 of the U.S. National Centers for Environmental Prediction is arguably among the best such models for predicting climate fluctuations on seasonal to inter-annual time scales. There is also evidence that the Indian monsoon is more predictable in theory than can be achieved with current prediction models. There are many sources of this predictability, including the influence of long-lived sea surface temperature anomalies in the tropical Pacific and Indian Oceans and of the soil moisture anomalies in Eurasia that act to alter the circulation and thermodynamic forcing of the atmosphere in the vicinity of south Asia, thereby influencing the precipitation over India during the Asian summer monsoon season. Skill of seasonal monsoon forecasts depends on the atmospheric response to slowly varying states of the components of the Earth system, which can be predicted weeks to months in advance. ENSO is the most famous coupled atmosphere ocean mode, which modulates the Indian summer monsoon through its slowly varying cycle (i.e. El Nino, La Nina) . Another important slowly varying component of the Earth system is soil moisture, which can influence weather and climate through its impact on evaporation and surface energy fluxes. Land atmosphere interactions have been recognized as one of the important sources of monsoon variability in many past studies (e.g. Shukla and Mintz , 1982; Webster , 1983; Meehl , 1997; Ferranti et al., 1999; Koster et al., 2004; Takata et al., 2009; Saha et al., 2011, 2012). However, there are very few measurements of land surface parameters, which restrict our ability to demonstrate impact of land surface on the seasonal monsoon rainfall. Many climate models have demonstration impact of soil moisture on rainfall and have raised hope for further improvements of land surface processes and their feedback with atmosphere, which eventually may lead to improvement in the seasonal forecast of Indian summer monsoon. The following tasks are planned to improve the land surface processes, their interactions and hence the monsoon simulation by CFSv2. Analyze climate simulations by CFSv2 (free run) and identify major biases in the model and possible link with the land surface processes. Compare the standalone LSM simulation using available observations and find out the nature of biases (i.e. whether same as in CFSv2 or different). Incorporate more realistic physical based scheme (which are also important for the monsoon) into LSM to improve biases identified in step 3 and then go to step 2. Cycle 24 will continue until there are reasonable improvements. Incorporate and test the improved LSM in CFSv2, i.e. go to step 1. CFS show strong dry bias over north and central India during monsoon season. Also the model simulated mean winter and spring snow over Eurasia is almost twice to that of the observation. It is shown that improvement in the winter/spring snow bias may improve the mean dry bias over north and central India (manuscript under revision). Step 2 is now undergoing. Some improvements are expected through first cycle of this work plan (i.e., 15) and within the time frame of this program. However, this cycle has to be continued for further developments along with the improved schemes in other components of the model (i.e. ocean and atmosphere). 2.4 Radiation Budget and Monsoon. It is generally accepted that to the first order approximation, the differential heating between the ocean and land areas over the Indian subcontinent is a major factor in the creation of the monsoon circulation (Ramage, pg. 8, 1971). The estimate of the magnitudes of the actual heat budget components from various earlier studies brings out several factors impacting this heat budget. A popular figure of these source and sink terms established for the earth-atmosphere system are shown in Fig.1. The heat budget of an atmospheric system such as the Indian monsoon, ignoring horizontal and vertical transport, consists of balancing the effects of shortwave radiative and condensational heating with the effects of longwave radiative and evaporative cooling. Heat transfer in the atmosphere occurs in three ways: conduction, convection and radiation. The conduction requires actual contact between the mediums involved in the energy exchange, and air being a poor conductor of heat; it has a limited impact on the vertical exchanges of energy through layers of the atmosphere. However for a homogeneous fluid like the atmosphere, both convection and radiation are important mechanisms in redistributing heat vertically in the atmosphere. If we consider the monsoon region as a closed system (or a box) and ignore advection from outside the system, solar radiation is the only incoming energy source. Within this box, the radiation interact with the constituents (atmospheric gases, clouds, aerosols, water vapor, green house gases, the earth’s surface to name few) that results in the creation of various types of internal heat source and sinks that transfer energy occurring at all spatial and temporal scales. Thus, knowledge of the radiation budget with the proper characterization of the heat sources and sinks is important in understanding the monsoon flow by giving one a feeling for the energy available for these motions. The estimation of the correct magnitude of heating and cooling is also important to improve the simulation of the radiation process and their feedback to the monsoon flow those are parameterized in the current state-of-the-art dynamical models used in monsoon forecast (e.g. CFS).